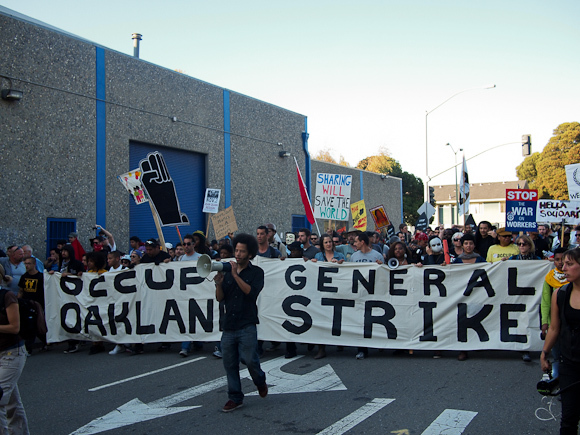 On November 2, tens of thousands of people participated in the first U.S. general strike in 65 years as parts of Oakland were shut down in solidarity with the Occupy movement. 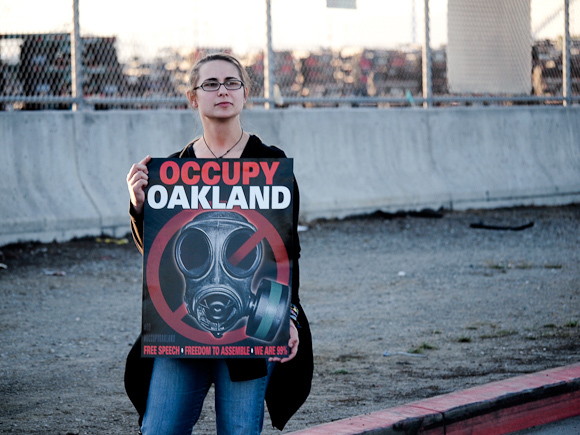 Protestors were spurred to action by the brutal repression and attempted eviction of the Occupy Oakland encampment the previous week, and quickly mobilized to retake the space and escalate the struggle. 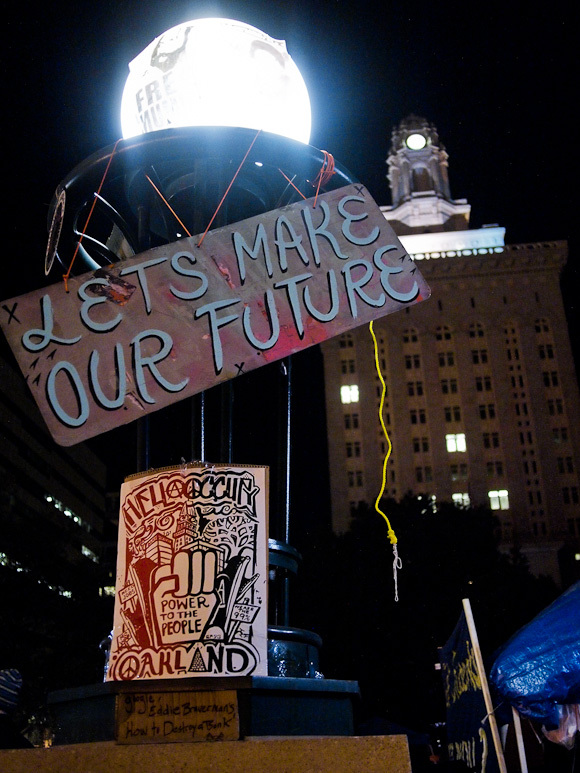 The night before: much of Occupy Oakland was quiet on Tuesday night as activists busied themselves finishing the plans, outreach, and banners for Wednesday’s general strike. 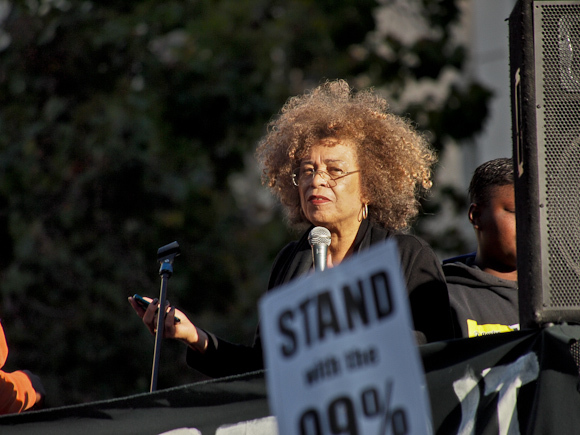 Angela Davis addresses the early morning rally at the intersection of 12th Street and Broadway in downtown Oakland, bringing reports and solidarity from her recent visits to Occupy demonstrations in New York City and Philadelphia. Students rally at Laney College for a public education feeder march to make demands around maintaining and expanding access to primary and higher education. 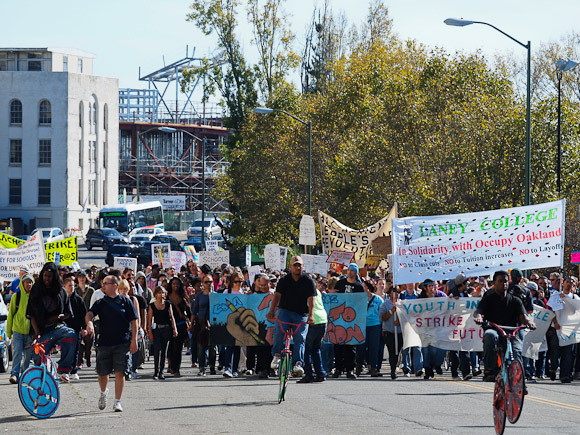 The education feeder march follows a crew of “scraper” bikes as it leads a brief rally on the steps of the Oakland Unified School District headquarters. 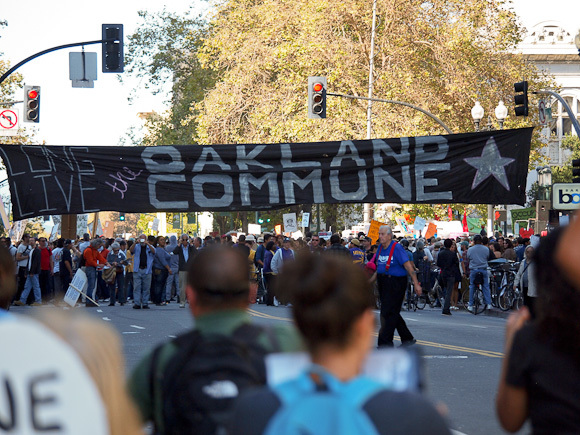 A large black banner welcoming strikers to the “Oakland Commune” hung across 12th Street. 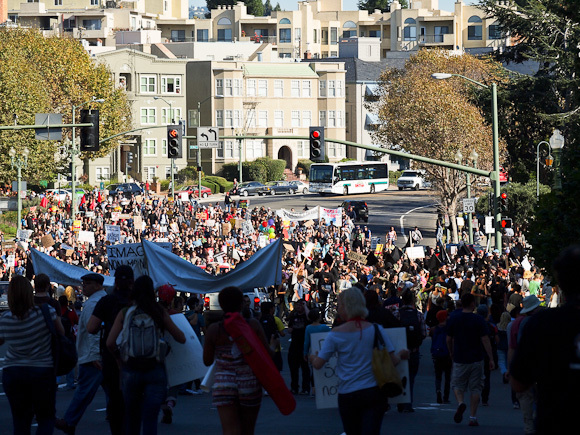 The UC Berkeley feeder march concludes its several miles long route to meet up with Occupy Oakland. 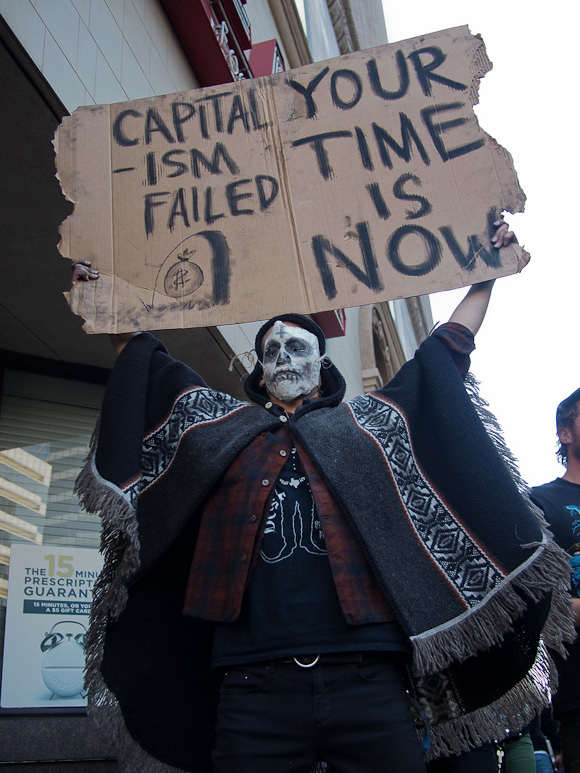 A demonstrator in Oscar Grant Plaza recognizes Dia de los Muertos with a call to bury the capitalist system. 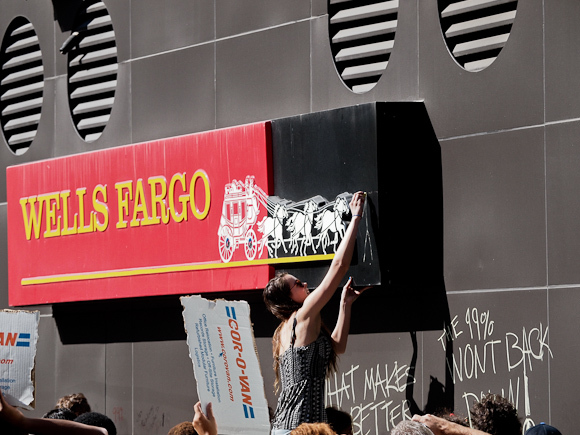 Protestors write slogans on a closed Wells Fargo bank with chalk. 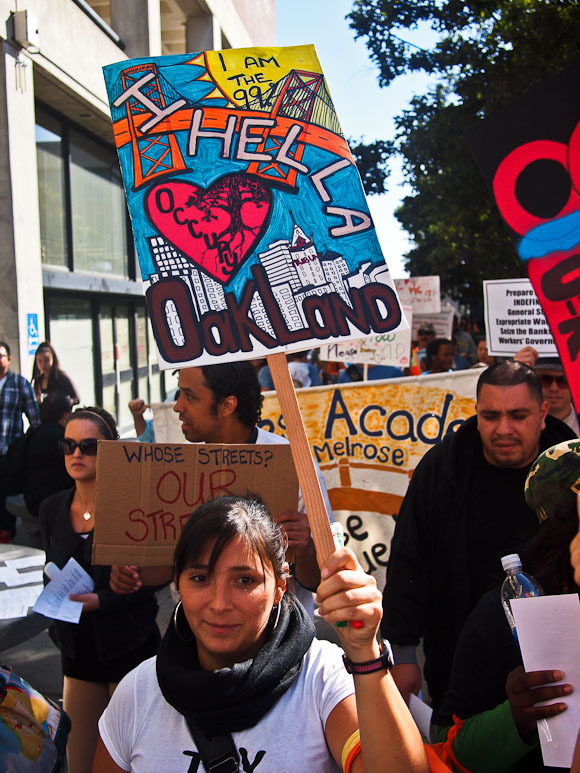 Practically all major banks in the downtown Oakland area were closed for the day. 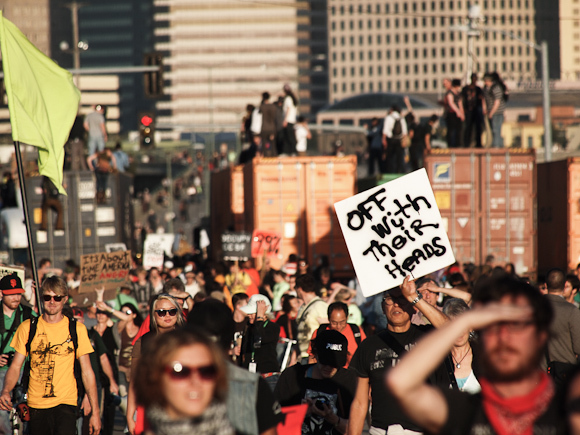 An anti-capitalist march rounds the corner of Harrison Street near Lake Merrit, en route to the Bank of America offices. 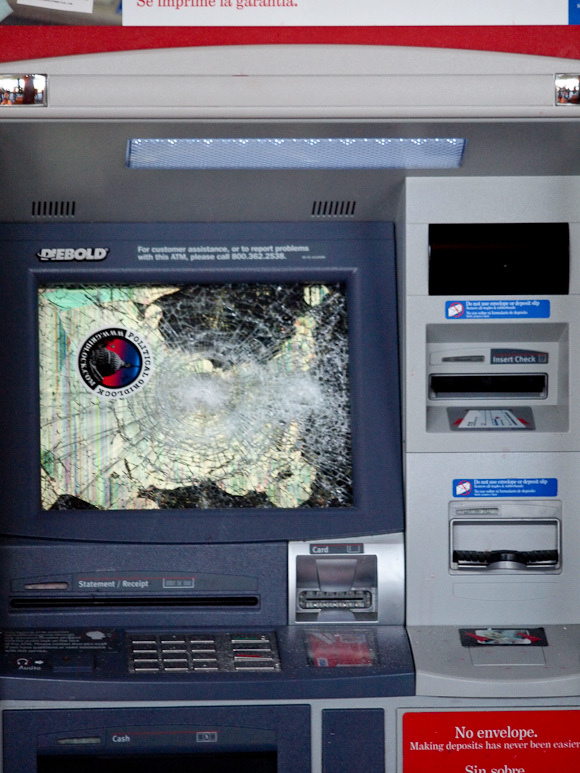 ATM out of order. 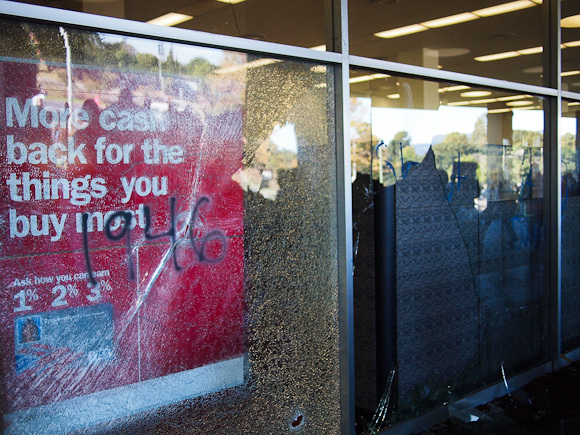 Members of a “black bloc” and others engaged in targeted property destruction at several banks in the area, igniting tactical debates within the march. The spirit of ’46: spraypainted numbers recall the last year workers walked out in a general strike in the United States — coincidentally, also in Oakland. 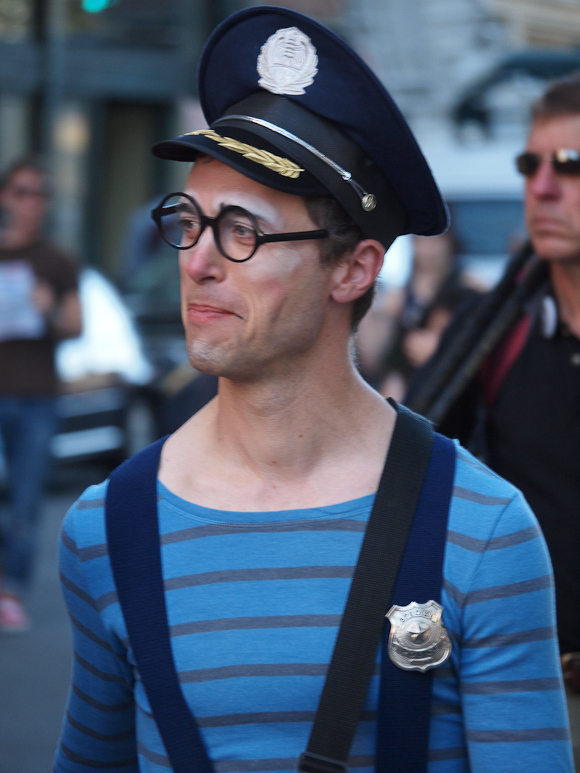 Dressed as a clownish police officer, one protestor simultaneously mocked the cops and provided directions to the crowd (with a dash of the “confusion” expressed in a Open Letter from the Oakland Police Officers Association. 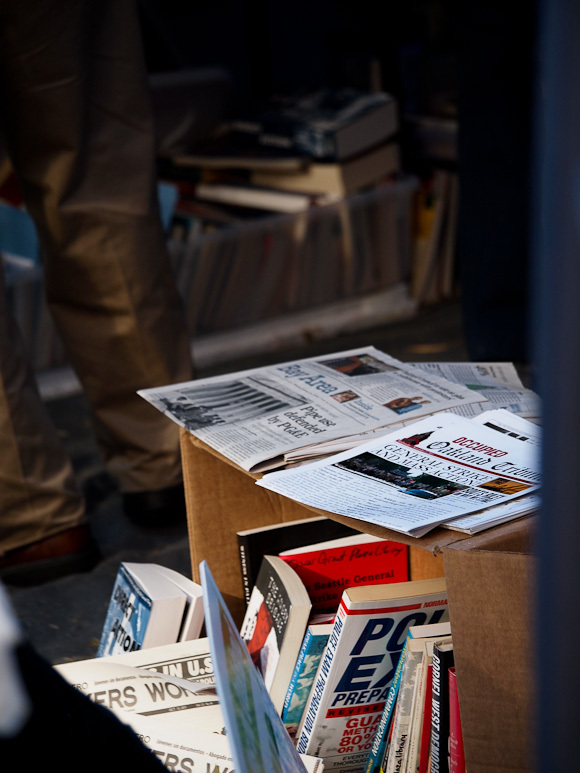 In the Oscar Grant Lending Library, fresh copies of the Occupied Oakland Tribune announce the general strike and mass actions of the day. 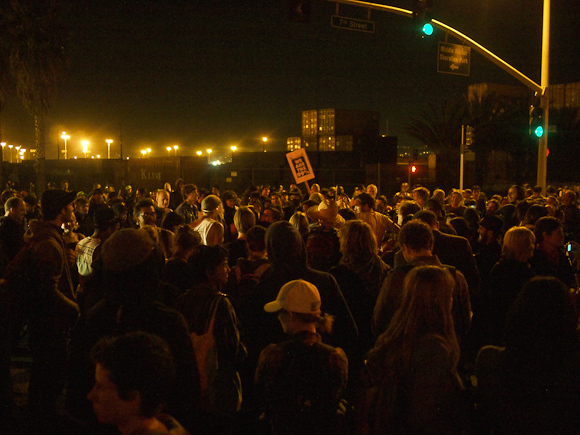 Rapper and political activist Boots Riley leads a march from Oscar Grant Plaza to the Port of Oakland, where demonstrators intended to shut down operations for the night shift. 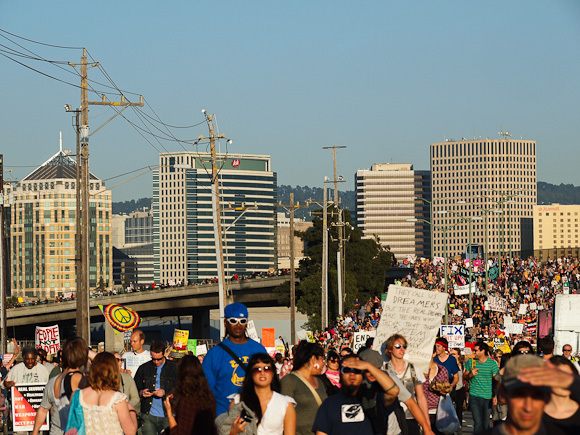 From across the Bay, a contingent from Occupy San Francisco can be seen in the distance behind their banner reading: We are the 99% – Somos el 99%! 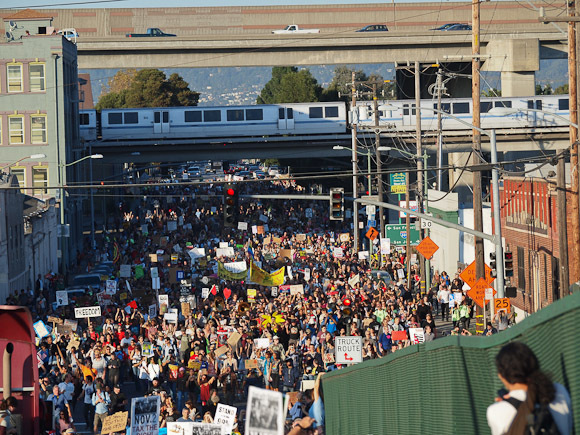 Waves of marchers filled Adeline Street on their way to the Port of Oakland. 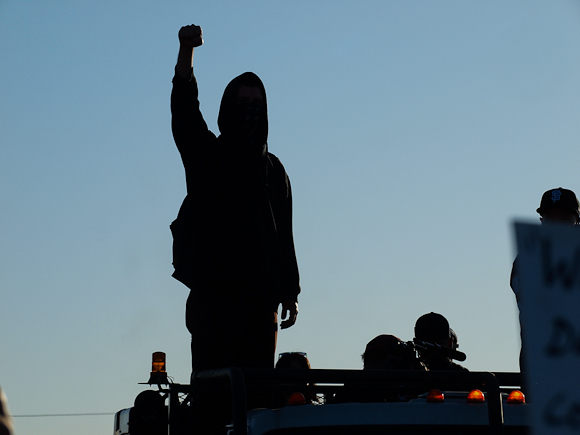 A hooded protestor raises a fist from the roof of a cargo truck. 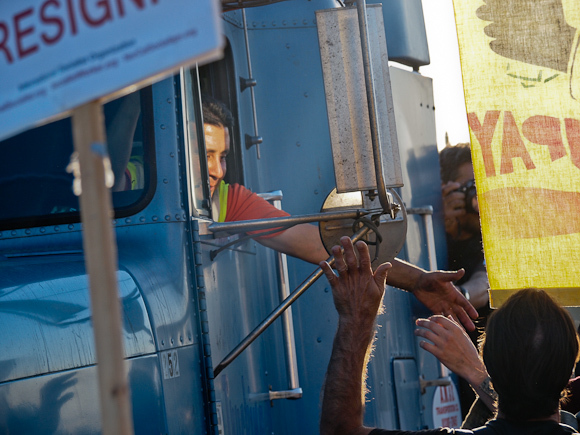 The driver of a port cargo truck greets demonstrators as they arrive to shut down the port. 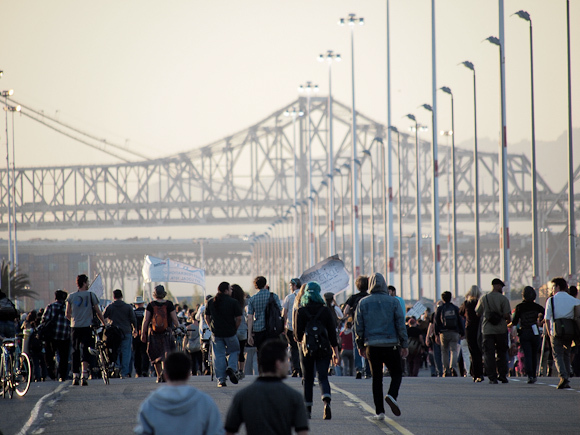 More and more marchers round the bridge entrance to the Port of Oakland. Estimates ranged from 15,000 up. 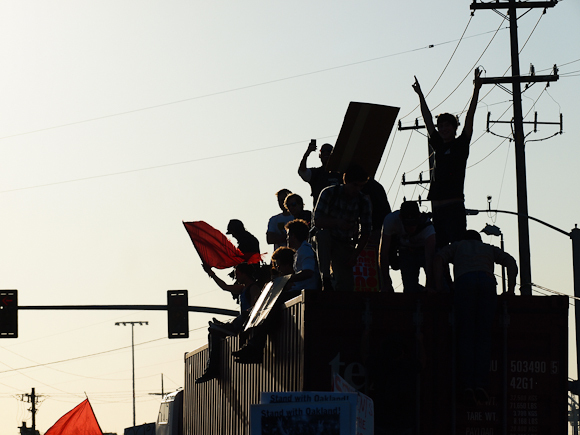 Raising the “victory” sign and waving red flags, protestors get a look at the march from the roof of a cargo truck. 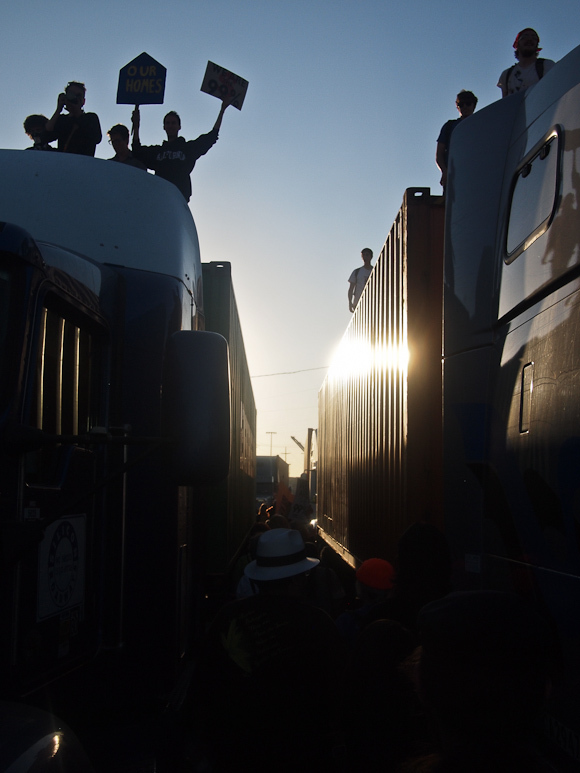 Parts of the march snaked through parked trucks in the roads of the port. 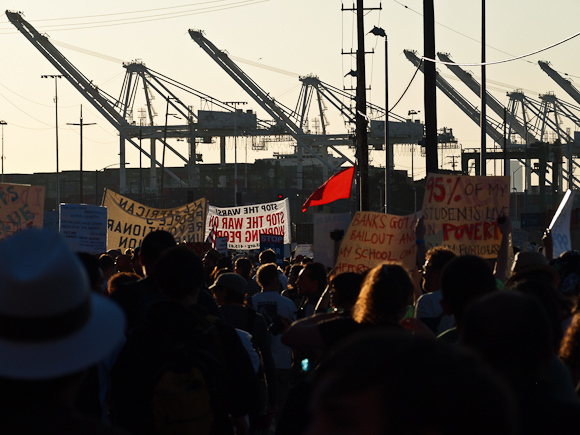 Approaching the cranes, demonstrators prepare to set up pickets at each port terminal to create conditions that would prevent the port’s night workers from reporting for their shift. 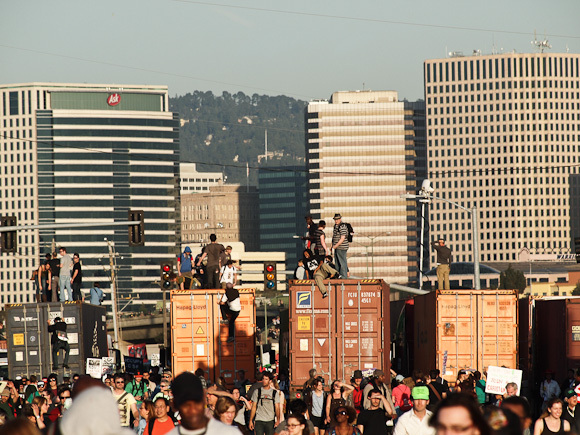 Downtown Oakland’s skyscrapers that tower over a second march leaving Oscar Grant Plaza fill in the background behind the sea of demonstrators already at the port. 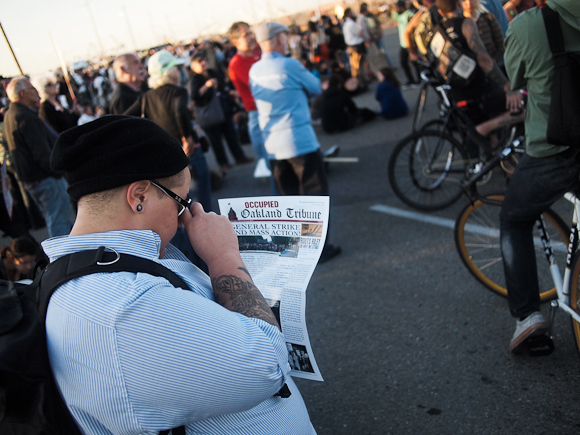 A demonstrator reads The Occupied Oakland Tribune broadsheet newspaper in the evening’s fading light. During the day, artists and printers distributed a variety of creative placards to demonstrators. 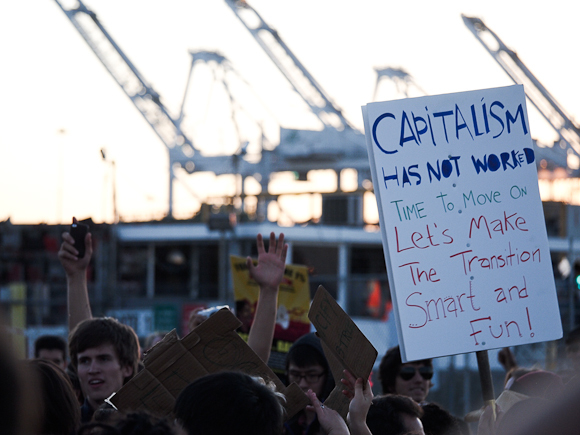 With the Bay Bridge before them, contingents of the march continue on to plug the port terminals further into the Bay. 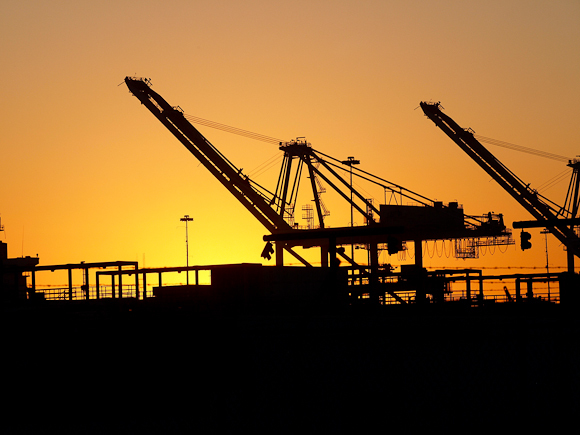 The sun sets behind the cranes of the Port of Oakland as the scheduled night shift approaches. Protestors wave their hands and signs during a brass band dance party at one picket line. 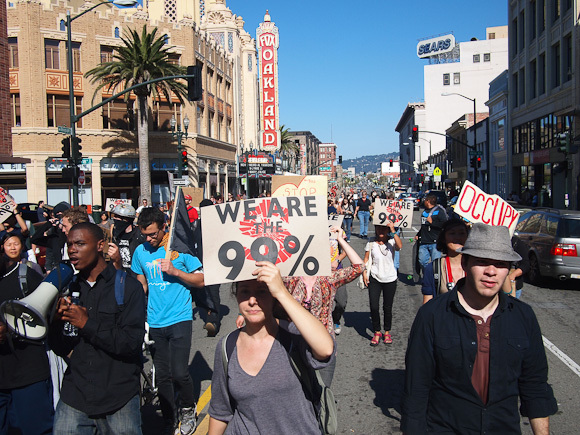 We the 99% – 100% Solidarity. 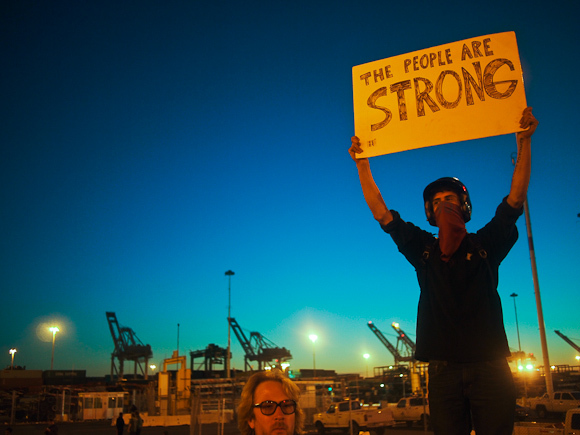 A masked protestor holds a sign reading “The People Are Strong”. 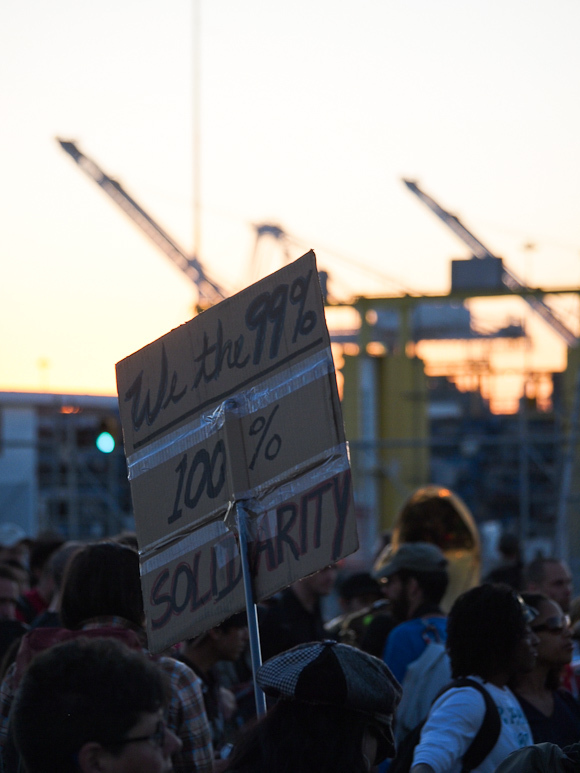 At an impromptu general assembly, picketers hear updates on the status of the port shutdown. 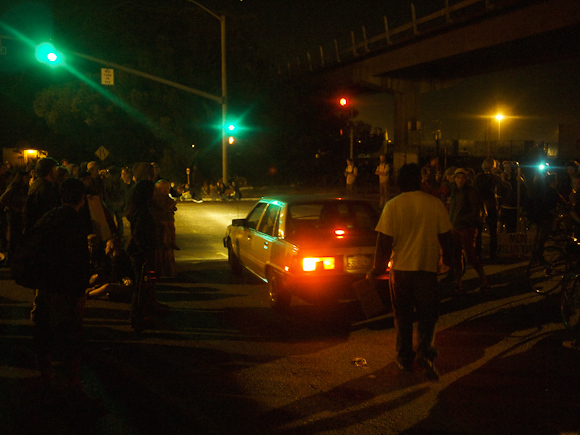 One of the last remaining port workers drives home to the cheers of the crowd: the port is closed for business. 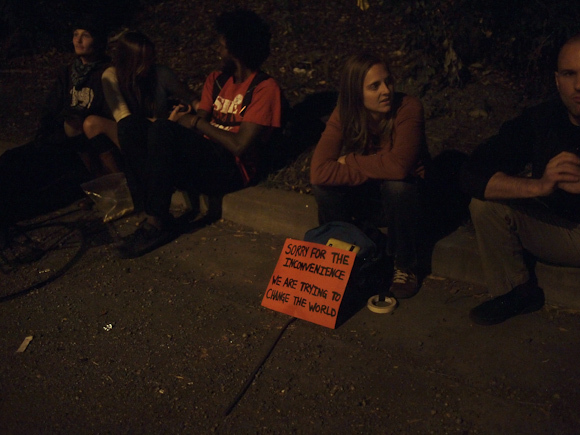 Demonstrators rest after a long, historic day. How about a Nation Wide Strike! Be sure to disconnect the unit (America) from the power supply before making necessary repairs. Then plug into a new power supply. 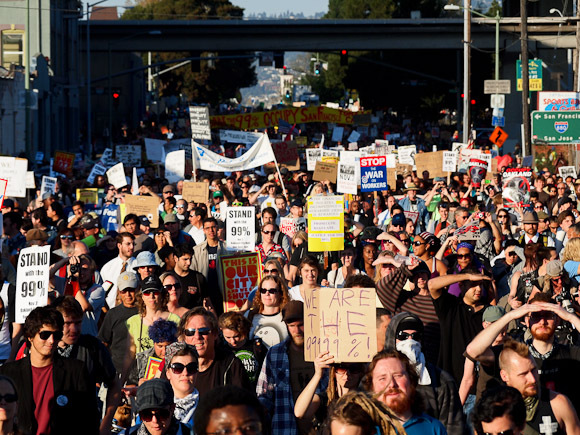 I am the 99% calling for a general strike for all America. This is really Amazing Issac. It really brought the event to life for those of us who were too far to be there.